The Continental Army consisted of soldiers from all 13 colonies and, after 1776, from all 13 states. At the start of the American Revolutionary War the colonial revolutionaries did not have an army. Previously, each colony had relied upon the militia, made up of part-time citizen-soldiers, for local defense, or the raising of temporary "provincial regiments" during specific crises such as the French and Indian War of 1754–63. On April 23, 1775, the Massachusetts Provincial Congress authorized the raising of a colonial army consisting of 26 company regiments. New Hampshire, Rhode Island, and Connecticut soon raised similar but smaller forces. On June 14, 1775, three days before the Battle of Bunker Hill, the Continental Congress in Philadelphia passed a resolution authorizing the formation of a Continental Army. The Army was authorized for 10 companies of expert riflemen: 6 in Pennsylvania, 2 in Maryland, and 2 in Virginia.On June 15, John Adams offered another resolution. It was that Col. George Washington of the Virginia Militia be appointed General and Commander-in-Chief, a position which Washington accepted the next day. At the same time as Washington's appointment, the Continental Congress also appointed certain other Generals. Artemas Ward, already in command of the men around Boston, was naturally chosen as the senior major-general. Next in rank was Charles Lee, a former British Army officer and a soldier-of-fortune. He would serve as a capable advisor on military matters to the Commander-in-Chief. The other major-generals chosen were Philip Schuyler and Israel Putnam. The brigadier-generals chosen were Seth Pomeroy, Richard Montgomery, David Wooster, William Heath, Joseph Spencer, John Thomas, John Sullivan, and Nathaniel Greene. The Adjutant General, with the rank of brigidier-general, was Horatio Gates. He was another former officer in the British Army. Soldiers in the Continental Army were citizens who had volunteered to serve in the army (but were paid), and at various times during the war, standard enlistment periods lasted from one to three years. Early in the war the enlistment periods were short, as the Continental Congress feared the possibility of the Continental Army evolving into a permanent army. Throughout the American revolution the Continental Army would see three major organizational approaches. These included the First Establishment (1775), the Second Establishment (1776), and the Third Establishment (1777 with ongoing changes through 1783). Throughout the entire course of the war, smaller regimental adjustments, reassignments, and changes were authorized. The army never numbered more than 17,000 men. Turnover proved a constant problem, particularly in the winter of 1776–77, and longer enlistments were approved. The Continental Army that served at Yorktown in 1781 bore very little resemblance to the Continental Army that blockaded Boston in 1775. Both sides faced a major problem raising and maintaining an army, so that the war could actually be fought, and they found radically different solutions to it. American troops initially belonged to the colonies or states, as there was, of course, that point no real central government. When the Congress authorized the 20,370-man army that its commander recommended, as a result of a visit to Boston by a committee from Philadelphia, it was seeking to build up, and formalize, a regular standing army on the European model, and it proposed that these men be organized in 26 single-battalion regiments. If realized, this plan would have given Washington and Americans a small but presumably efficient force with which he could meet the British on their own terms. During the first year of the war, about 27,500 men were officially carried on the national rolls. 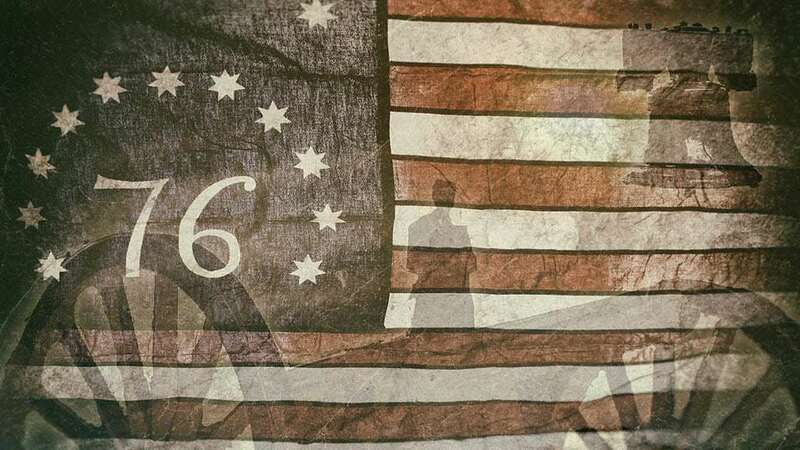 For 1776, Congress authorized 27 regiments, then later in the year, it upped the number to 88 regiments, and tried to enlist men for the duration of the war. Then, at the very end of the year, it voted to raise another 16 regiments, as well as cavalry and artillery formations. In fact, authorized strength was never reached, in spite of the offering of enlistments bounties either of hard money or future land grants, and there were fewer troops under arms in 1777 than the year before, and fewer still in 1778. For 1779, recognizing both reality and the diminution of activity, the figures were adjusted downward, back to 80 battalions, and for the last 2 years of the war, down again to a merely 58 regiments. Figures compiled after the war showed that there had been some 232,000 enlistments in the Continental Army; many of these were reenlistments, so it is estimated that they represent perhaps 150,000 men. In addition to the regulars, there existed the militia. Every able-bodied man was officially part of the militia, and subject to call-up in an emergency. They tended at times to be poorly disciplined and commanded, though some militia fought very bravely and acted accordingly. The figures for militia service are far less reliable than for the regulars, but there seem to have been about 145,000 periods of service under militia auspices. Taking regulars and militia together, the total would be about 377,000 enlistments, of which settles down to around a range of 175,000 to 225,000 men serving in the armed forces of the Revolutionary War. This represents roughly 8-10% of the total population, a population which included women, children, and older people. The peak strength for a year was at 89,000 in 1776, and half of those were militiamen. The highest strength of the Continental Army came in 1778, at 35,000, and Washington never commanded more than 17,000 troops (regular and militia combined) at any one time. The Continental Army was composed mainly of infantry with limited cavalry and artillery. The basic unit of infantry organization was the regiment, composed of eight or more companies. On June 14th, 1775, the Second Continental Congress established the Continental Army. Throughout the American revolution the Continental Army would see three major organizational approaches. These included the First Establishment (1775), the Second Establishment (1776), and the Third Establishment (1777 with ongoing changes through 1783). Throughout the entire course of the war, smaller regimental adjustments, reassignments, and changes were authorized. A typical infantry regiment might include 728 men from 8 companies, a Colonel, Lieutenant Colonel, and Major. Staff could include an Adjutant, Quartermaster, Surgeon, Surgeon's Mate, Paymaster, and Chaplin. Not all regiments were filled at all times. Cavalry regiments were similarly structured. Artillery Regiments could include specialized companies of soldiers that included bombardiers, gunners, and matrosses. Rather than as a large, regiment force, they would function in smaller, specialized groups to support strategic battle needs as necessary. The platoon will form the smallest tactical unit (firing body). The platoon will consist of a minimum of 16 men and a maximum of 31 men. The platoon will be officered by 1 Lieutenant posted on the right of the front rank, 1 Sargeant posted on the right of the second rank covering the lieutenant and 1 Corporal posted on the left of the front rank. These men are to be included as part of the 16 man minimum. Platoon officers will stay in these positions at all times during a battle, never quitting their posts and only take commands from their Grand Division Captain. A regiment or battalion served as the basic tactical unit. The terms regiment and battalion were virtually interchangeable at that time since nearly every Continental Army regiment consisted of a single battalion. It contained eight to 10 platoons, the number needed in linear warfare to provide a constant wave of volley fire. Customarily in both the American and British armies of the Revolution, a regiment of eight companies would form a single battalion with each company serving as a single platoon. Regiments were administrative formations; different terms were used when talking about tactical employment. At full strength, an eight-company infantry regiment would contain about 728 officers and men. "The primary recruiting and “building block” unit was the regiment or battalion, the terms being very close to interchangeable in use. In general, the term “battalion” was more commonly used during the first years of the war, “regiment” becoming dominant by the mid-war period. The typical regiment consisted of between eight and ten companies, the official structure for a significant portion of the war calling for nine companies per regiment." "A brigade, the next progressive unit of organization, was generally composed of between three and five regiments. The brigade was the primary operational or “functioning block” of the army, the regimental composition of many brigades frequently remaining constant for up to three or more years. The brigade became the primary operational unit particularly due to its typical level of manpower. While the theoretic “on paper” strength of a Continental regiment called for approximately 750 officers and men, such numbers were essentially never met and the typical regiment was more commonly capable of fielding only one-half or less of that designated quota. The typical brigade, numbering between approximately 1,200 and 1,750 effective s, therefore, presented a combat unit of particularly flexible tactical size. As a further demonstration of the high priority of state orientation and allegiance, virtually all Continental brigades were composed of regiments of the same state." A brigade was usually formed of several regiments plus an attached direct support artillery company and was usually commanded by a brigadier general; a division consisted of several brigades commanded by a major general. In the northern areas, the artillery consisted of a brigade of four regiments and several separate companies under the Chief of Artillery, Henry Knox. Knox employed some of the separate companies in direct support of the infantry brigades but used others in garrison or general support assignments. The army’s mounted arm consisted of four regiments of light dragoons, normally employed in reconnaissance and counter reconnaissance duties, plus several smaller units, including two deep-strike partisan corps (a mix of light dragoons and light infantry). Other regular forces included a corps of engineers; three companies of sappers and miners; several military police elements; two regiments of artificers, who handled the servicing and repair of ordnance and vehicles; and a headquarters guard force. The next level of organization “up the ladder” was the division, typically composed of between two and four brigades. Due to varying geographic troop requirements, the capacity for interstate support, and the dependence on a quite limited number of qualified candidates for becoming effective major generals, divisions tended to be less stable in composition than were brigades, and also became of much greater functional significance during periods of major campaign activity. During certain periods of active campaigning, divisions were at times aggregated into larger units termed wings. Unlike the corps level of the Civil War during the following century, the wing was very much an ad hoc unit, primarily employed during major campaigns and/or in circumstances of extended lines of occupation. Clearly, both these examples illustrate situations in which Washington chose to delegate partial strategic as well as tactical management, and desired effective coordination at an operational tier above the divisional level. For primarily administrative rather than operational purposes, the Congress established seven departments, extending from Canada to the southern border of Georgia. These, unsurprisingly, varied greatly in size, one department covering all of eastern Canada, while the critically strategic Highlands Department contained only a few counties of northern New Jersey and southern New York. While a department was not truly an operational army “level”, orderly books were kept at and orders, of course, were issued from departmental headquarters. The former books, when containing no “lower” level orders, are provided a specific section of this Index. Likewise, several major forts’ garrisons maintained books applying specifically to those fortifications. Orderly books relating to such garrisons are likewise provided specific Index cataloging.